The young Paduan nobleman Alessandro Papafava put together a precious collection of architectural drawings during a period of residence in Rome (1803-1807) following Antonio Canova’s suggestion. In this collection, which has been preserved in its entirety, alongside drawings by Mario Asprucci and John Michael Gandy, we find wonderful watercolours by Giacomo Quarenghi. 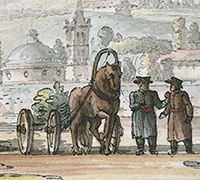 The drawings were recently donated to the Palladio Museum by the heirs of Papafava, and will be the subject of an exhibition curated by Alistair Rowan, former president of the Society of Architectural Historians of Great Britain, and by Susanna Pasquali, who teaches at the Sapienza University of Rome.